Tokyo 2020 Olympic Games organizers have formally proposed moving the start time of the marathon races forward to avoid the worst of the Japanese capital's scorching summer heat. The marathon events were initially scheduled to start at 7 a.m. local time but now Games organizers have asked the IAAF, athletics’ governing body, to approve moving the start time to either 5.30 a.m. or 6.00 a.m. local. The Tokyo 2020 Games will run from July 24 – Aug. 9. Temperatures in Tokyo reached a record 41.1 degrees Celsius (106 Fahrenheit) this year, with the July average reaching more than 30 degrees since 1998, according to the Japanese Meteorological Agency. 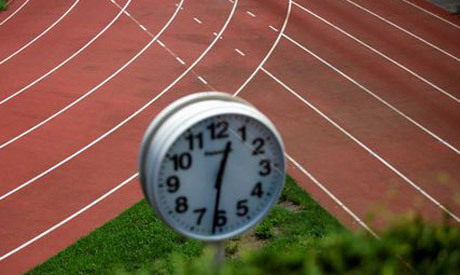 There were even calls to introduce daylight savings time for the Games but with those plans squashed, an earlier start time is likely to appease athletes and spectators alike worried about the heat. The times for the rugby and mountain bike events have also been changed after the IOC’s Coordination Commission took advice from a team of experts. "Based on the proposals of the IOC’s expert group, we are proceeding to recommended earlier starting times for the men’s and women’s marathons and the 20 kilometer race walk,” said Tokyo 2020 President Yoshiro Mori in Tokyo on Wednesday. All the morning rugby sessions will now start at nine a.m., one and a half hours earlier than previously scheduled, with the cross-country cycling push back an hour into the early evening. “It will continue to be front of mind for us and the organizers and front of mind for the teams that are coming here,” added commission chair John Coates. Tokyo 2020 organizers are due to announce version three of the budget on December 21 and the swathe of heat counter-measures proposed, including increased shade for spectators and a heat-blocking surface to the road, will add to the costs involved. “There is a list of about 20 precautions they think we ought to take and they are not going to be free,” said Coates. Despite this, Coates and the Tokyo 2020 organizers are confident that the operating budget will break even. “There is still someway to go in terms of sponsorships, to balance the operating budget and there is still the ticket revenue to be achieved,” said Coates. The costs for the Games’ venues, which are largely all running to schedule, will be absorbed by the Tokyo Metropolitan Government and are separate to the operating costs.